OUT OF PRINT: New and used copies of the 1st edition may be available for a while longer on AMAZON and eBay. 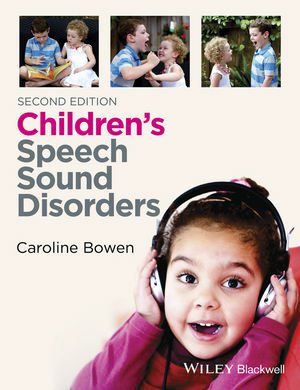 Caroline Bowen's Children's Speech Sound Disorders will be welcomed by experienced and novice clinicians, clinical educators, and students in the field of speech-language pathology/speech and language therapy for its practical, clinical focus. 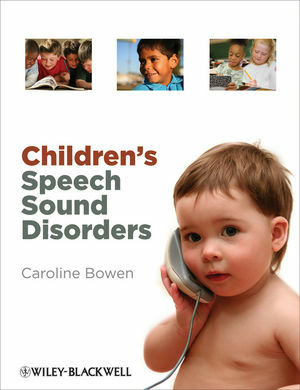 Drawing on the evidence base where possible, and making important theory to practice links overt, Bowen enhances her comprehensive account of assessment and clinical management of children with protracted or problematic speech development, with the addition of forty nine expert essays. These unique contributions are authored by fifty one internationally respected academicians, clinicians, researchers and thinkers (listed below) representing a range of work settings, expertise, paradigms and theoretical orientations. In response to frequently asked questions about their work they address key theoretical, assessment, intervention, and service delivery issues. Bowen's undisputed enthusiasm for her topic, concern for client care, emphasis on the role and participation of families in intervention, and four decades of dealing with the realities of hands-on clinical practice permeate the work, affirming what speech and language clinicians do, on a day-to-day basis, with children with mild, moderate, severe and persistent difficulties with speech acquisition. As well as the expert essays it includes case vignettes, clinical nuggets, practical strategies and real world examples. Baker, E. (2009). The why and how of prioritising complex targets for intervention. In C. Bowen, Children's speech sound disorders. Oxford: Wiley-Blackwell, pp. 72-77. Bernhardt, B. M. & Ullrich, A. (2009). Constraints-based nonlinear phonology: Why and how to start. In C. Bowen, Children's speech sound disorders. Oxford: Wiley-Blackwell, pp. 189-194. Bernthal, J. E. & Overby, M. S. (2009). The teacher-researcher shortage: Possible future directions. In C. Bowen, Children's speech sound disorders. Oxford: Wiley-Blackwell, pp. 347-349. Bleile, K. (2009). A Nicaraguan experience. In C. Bowen, Children's speech sound disorders. Oxford: Wiley-Blackwell, pp. 111-114. Dodd, B. (2009). Finding the correct dose of intervention for developmental speech impairment. In C. Bowen, Children's speech sound disorders. Oxford: Wiley-Blackwell, pp. 322-327. Flahive, L. K. (2009). Treat the symptoms, not the label. In C. Bowen, Children's speech sound disorders. Oxford: Wiley-Blackwell, pp. 234-237. Flipsen Jr, P. (2009). Severity and speech sound disorders: A continuing puzzle. In C. Bowen, Children's speech sound disorders. Oxford: Wiley-Blackwell, pp. 65-68. Froud, K. (2009). Understanding and addressing the theory-to-practice divide in clinical training and practice. In C. Bowen, Children's speech sound disorders. Oxford: Wiley-Blackwell, pp. 195-198. Gibbon, F. E. (2009). Vowel errors in children with speech disorders. In C. Bowen, Children's speech sound disorders. Oxford: Wiley-Blackwell, pp. 147-151. Gillon, G. T. (2009). New Zealand speech-language therapy: Partnerships between the academic and educational community. In C. Bowen, Children's speech sound disorders. Oxford: Wiley-Blackwell, pp. 165-169. Golding-Kushner, K. J. (2009). Issues in speech development, assessment and intervention for children with craniofacial disorders, cleft palate and velopharyngeal dysfunction. In C. Bowen, Children's speech sound disorders. Oxford: Wiley-Blackwell, pp. 85-90. Gretz, S. (2009). Apraxia-KIDSSM and the Childhood Apraxia of Speech Association of North America. In C. Bowen, Children's speech sound disorders. Oxford: Wiley-Blackwell, pp. 32-35. Hesketh, A. (2009). PA intervention for children with speech disorder: Who, when and how? In C. Bowen, Children's speech sound disorders. Oxford: Wiley-Blackwell, pp. 143-147. Highman, C. (2009). Keeping abreast of the evidence base. In C. Bowen, Children's speech sound disorders. Oxford: Wiley-Blackwell, pp. 218-223. Hodge, M. (2009). What can we learn about clinical practice from SLPs' experiences using nonspeech oral motor exercises in children's speech therapy? In C. Bowen, Children's speech sound disorders. Oxford: Wiley-Blackwell, pp. 161-165. Ingram, D. (2009). The role of theory in speech sound disorders. In C. Bowen, Children's speech sound disorders. Oxford: Wiley-Blackwell, pp. 23-26. James, D. G. H. (2009). The relationship between the underlying representation and surface form of long words. In C. Bowen, Children's speech sound disorders. Oxford: Wiley-Blackwell, pp. 329-334. Joffe, V. L. (2009). A survey of clinical practice in the UK. In C. Bowen, Children's speech sound disorders. Oxford: Wiley-Blackwell, pp. 175-179. Lancaster, G. (2009). Auditory input therapy. In C. Bowen, Children's speech sound disorders. Oxford: Wiley-Blackwell, pp. 129-133. Leitao, S. (2009). Clinical decision making: Art and science. In C. Bowen, Children's speech sound disorders. Oxford: Wiley-Blackwell, pp. 358-360. Lof, G. L. (2009). The nonspeech-oral motor exercise phenomenon in speech pathology practice. In C. Bowen,Children's speech sound disorders. Oxford: Wiley-Blackwell, pp. 181-184. Louw, B. (2009). An assets-based approach to early communication intervention (ECI). In C. Bowen, Children's speech sound disorders. Oxford: Wiley-Blackwell, pp. 169-174. Lowe, R. J. (2009). The role of intrinsic motivation in learning of new speech behaviours. In C. Bowen, Children's speech sound disorders. Oxford: Wiley-Blackwell, pp. 101-105. McComas, K. (2009). Developing professional identities: A goal for educational programs. In C. Bowen, Children's speech sound disorders. Oxford: Wiley-Blackwell, pp. 185-189. McLeod, S. (2009). The contribution of the ICF-CY to working with children with speech impairment. In C. Bowen, Children's speech sound disorders. Oxford: Wiley-Blackwell, pp. xiv-xvii. Miccio, A. W. (2009). First things first: Stimulability therapy for children with small phonetic repertoires. In C. Bowen, Children's speech sound disorders. Oxford: Wiley-Blackwell, pp. 96-101. Munson, B. (2009). Pathology or social indexing? In C. Bowen, Children's speech sound disorders. Oxford: Wiley-Blackwell, pp. 342-346. Neilson, R. (2009). Teachers and speech-language professionals: Communicating at the chalkface. In C. Bowen, Children's speech sound disorders. Oxford: Wiley-Blackwell, pp. 106-110. Nunes, A. (2009). A legacy lost. In C. Bowen, Children's speech sound disorders. Oxford: Wiley-Blackwell, pp. 4-7. Pascoe, M. (2009). Going between: Intervention for children's speech sound difficulties from an international perspective. In C. Bowen, Children's speech sound disorders. Oxford: Wiley-Blackwell, pp. xxii-xxiv. Pollock, K. E. (2009). Internationally adopted children learning English as a second first language. In C. Bowen, Children's speech sound disorders. Oxford: Wiley-Blackwell, pp. 91-95. Powell, T. W. (2009). Non-speech oral motor exercises: An ethical challenge. In C. Bowen, Children's speech sound disorders. Oxford: Wiley-Blackwell, pp. 199-202. Purdy, S. C. (2009). Hearing and speech sound disorders. In C. Bowen, Children's speech sound disorders. Oxford: Wiley-Blackwell, pp. 350-358. Raz, M. G. (2009). One clinician's streamlining of traditional articulation therapy. In C. Bowen, Children's speech sound disorders. Oxford: Wiley-Blackwell, pp. 14-17. Rippon, H. (2009). Jeff's Scarf Story. In C. Bowen, Children's speech sound disorders. Oxford: Wiley-Blackwell, p. 248. Rosenthal, J. B. (2009). Key components of a survival kit: Theory, evidence and experience. In C. Bowen, Children's speech sound disorders. Oxford: Wiley-Blackwell, pp. 346-366. Roulstone, S. (2009). Screening for speech impairments. In C. Bowen, Children's speech sound disorders. Oxford: Wiley-Blackwell, pp. 51-55. Ruscello, D. M. (2009). Treating compensatory errors in the cleft palate population: Some treatment techniques. In C. Bowen, Children's speech sound disorders. Oxford: Wiley-Blackwell, pp. 289-293. Rvachew, S. (2009). Perceptually based interventions. In C. Bowen, Children's speech sound disorders. Oxford: Wiley-Blackwell, pp. 152-155. Skinder-Meredith, A. E. (2009). Speech characteristics rating form. In C. Bowen, Children's speech sound disorders. Oxford: Wiley-Blackwell, pp. 227-233. Stoeckel, R. (2009). Discussing appropriate treatment options for children with speech sound disorders and co-morbid conditions. In C. Bowen, Children's speech sound disorders. Oxford: Wiley-Blackwell, pp. 214-217. Stoel-Gammon, C. (2009). Assessment and analysis of the speech of an unintelligible preschool child. In C. Bowen, Children's speech sound disorders. Oxford: Wiley-Blackwell, pp. 60-64. Stone-Goldman, J. (2009). Choosing where to start. In C. Bowen, Children's speech sound disorders. Oxford: Wiley-Blackwell, pp. 256-262. Strand, E. (2009). Dynamic assessment of motor speech disorders in children. In C. Bowen, Children's speech sound disorders. Oxford: Wiley-Blackwell, pp. 265-269. Watts Pappas, N. (2009). The Australian experience of family-centred practice in intervention for speech impairment. In C. Bowen, Children's speech sound disorders. Oxford: Wiley-Blackwell, pp. 157-160. Williams, A. L. (2009). Assessment and intervention from a systemic perspective. In C. Bowen, Children's speech sound disorders. Oxford: Wiley-Blackwell, pp. 124-129. Williams, P. (2009). The Nuffield approach to childhood apraxia of speech and other severe speech disorders. In C. Bowen, Children's speech sound disorders. Oxford: Wiley-Blackwell, pp. 270-275.